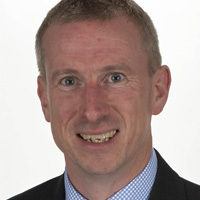 Mr James Robinson is a consultant orthopaedic surgeon specialising exclusively in knee surgery. His NHS practice is based at the Avon Orthopaedic Centre in Bristol. He also works privately in Bristol and at the International Knee and Joint Center Abu Dhabi. James undertook his medical degree and registrar training in London. Here was also Clinical Research Fellow in Sports Trauma Surgery at the Imperial College of Science Technology and Medicine. He published his thesis on knee ligament injuries and was awarded a Master of Surgery degree by the University of London. His fellowship training was at the Clinique du Sport in Bordeaux. James' ACL research has previously won the British Association of Surgery of the Knee President’s medal. He has published many research articles and book chapters on knee surgery and received awards both nationally and in Europe for knee research. Amongst other roles, he is a reviewer for the American Journal of Sports Medicine, a member of the European Society for Sports Traumatology, Knee Surgery and Arthroscopy (ESSKA) Arthroscopy committee and a member of the international ACL Study Group.